As wildflowers blanket the desert valleys and mountainsides, spring is the most beautiful time to experience the Sonoran Desert of Arizona. February, March, and April provide the best months for viewing the fantastic Arizona wildflower displays, with March being the definite peak. The variety of flowers is stunning, with desert trees, cactus, and shrubs all providing their own flare to the landscape. We’ll first cover the most common Sonoran Desert wildflowers, then give out some tips about where you might see some awesome displays! Brittlebush, the little sunflowers of the Arizona desert. The grand-daddy of Sonoran Desert wildflowers. For most desert flowers, to see fields of them, you must travel to very specific locations. Brittlebush is very common along most hillsides, so brilliant displays can be found in almost any corner of the Arizona desert. A member of the sunflower family, Brittlebush is typically 2-3 feet tall with blue/gray leaves and thin stalks that can hold dozens of yellow wildflowers on each bush. They don’t like frost, so you will find them of hillsides facing the sun. It’s possible to see these blooming from February until April depending on the location. Note the shape and color of the leaves. You can see how this plant produces such spectacular displays with each bush holding dozens of flowers. The flower is usually pink or purple, with a funnel shape that can be up to 3 inches wide. You can find these in almost any part of the desert, on hillsides and on valley floors alike. The hedgehog cactus usually blooms from mid-March into early-April. A golden hedgehog blooms pink in mid-March. It’s not every year that this flower blooms, but when it does, it really puts on a show. Perhaps the most famous of the Sonoran Desert wildflowers, it can blanket entire hillsides during banner years. Forming as a small yellow cup made of four petals, this flower is simple yet elegant. The Mexican Gold Poppy usually grows on rocky hillsides or slopes, and is most typically seen during March. 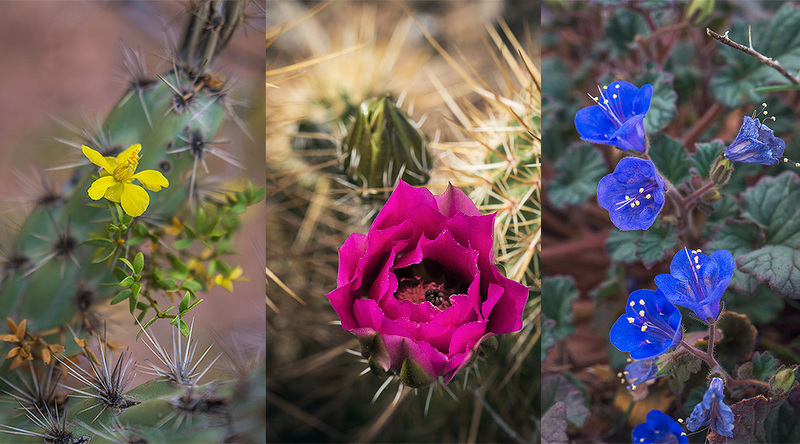 These flowers don’t grow everywhere, so you’ll have to go to specific places like Peridot Mesa, Lost Dutchman State Park, or Picacho Peak to find them. If you wish to see the cup open, you must look for them mid-day because they only open when in direct sunlight. Mexican Gold Poppies in the Sonoran Desert Preserve north of Phoenix. Another beautiful yellow wildflower, the Desert Marigold is somewhat similar to brittlebush in its many stalks growing from one plant. However, the flowers are slightly larger at 2 inches in diameter and have their own distinct beauty. It is not common but possible to see fields of these flowers, and are typically found in sandy soils atop mesas or in desert washes. Desert Marigold in bloom along a neighborhood drainage in Peoria, Arizona. A messy-looking bush about 5 feet in height that occasionally puts out little red tube-shaped flowers. While most of the most spectacular flowering shrubs make yellow flowers, this one adds a little different flavor when it comes out. You may start to see these in early February and can go strong through the end of March. It seems to like the rocky hillsides where the brittlebush also thrives. The most fun part of this flower is that you can eat it and it tastes like cucumber! The red, tubular flowers of the Chuparosa. Creosote is one of the larger desert shrub, often standing up to six feet tall. It’s a highly drought tolerant plant that can survive in the hottest and driest of deserts like Death Valley. It emits a strong fragrance when it rains, often called “smell of the desert”. It also makes tiny, rough-looking yellow flowers through the spring months. Pure stands of creosote in full bloom can turn the parched desert slopes into gold. Creosote bushes create yellow flowers with twisted petals. Also known as Blue Phacelia or Wild Heliotrope. This is a tiny desert plant that produces tiny, blue cup-shaped flowers. You may see Scorpionweed in a variety of places such as sandy washes or rocky slopes. It is also known for the harsh scent that it emits when crushed, usually by the feet of passing hikers. Scorpionweed in prosperity along a neighborhood wash.
With it’s flat, pear shaped green pads, the Englemann Prickly Pear is one of the easiest cactus for desert newcomers to identify. While there are a few species of prickly pear in the Sonoran Desert, this one is the most common. However, it does tend to grow at higher elevations so you will only see them rarely among the sea of teddy bear cholla, saguaro, and buckhorn. Climb the neighboring mountainsides, and they are much more common. It’s flowers are yellow and cup shaped, and shown themselves in from late March to early May. Venture out in early summer to see their sweet pink fruit. Three prickly pear flowers in bloom with many more ready to make an appearance. Named for their branching segments that resemble the antlers of a male deer, these two species are common throughout the Sonoran Desert at almost any elevation. Staghorn (Opuntia versicolor) often show a purple tone on the normally green segments, but Buckhorn (Opuntia acanthocarpa) can have this coloring as well. Buckhorn have a larger range, growing throughout the Sonoran Desert, while Staghorn only grow in the desert surrounding Tucson and down into Mexico. To truly tell the difference between the two, the flowers are actually the best method! Inside the flower are little string-like fibers called filaments, which hold up a yellow cap called the anther. The Buckhorn has red filaments, while the Staghorn has green/yellow filaments. The actual color of the cactus petals have a broad range: yellow, red, pink, purple, apricot. Buckhorn Cholla bloom red at Picacho Peak State Park. The saguaro cactus is the undisputed symbol of the Sonoran Desert, and a prominent icon for the state of Arizona. Growing upwards of 25 feet tall, and often containing dozens of upreaching arms, this cactus is a sight to behold. Saguaro cactus flowers are big white flowers that grow on the ends of green stems. These stems grow from atop of the arms of the cactus itself, so to seem them up-close, you must get uphill from a blooming saguaro. Each flower blooms for an average of 24 hours, so don’t expect to come back the next day to snag a photo! Blooming season for the saguaro is typically April and May. A single flower blooms atop a giant saguaro. Frank Lloyd Wright called the Teddy Bear Chola the “dangerous blonds of the desert”. With their dark body and bright tops, these cactus look cuddly from a distance, but you don’t want to snuggle with them. They have barbed spines that snag onto passing humans and animals alike, hence the term “jumping cactus”, so you’ll need extra caution when viewing flowers up close. While similar in form to the other flowers of the Opuntia genus, the Teddy Bear have white color with a green tinge that makes them quite unique. Come along in April after a wet year see them in force on the rocking slopes of dry desert mountains. Teddy Bear Cholla know how to dress classy with their elegant white flowers. Next, some suggestions of places to visit where good Arizona wildflower blooms tend to happen! While you may be able to enjoy wildflowers from the roadside, finding the truly impressive displays usually requires some degree of hiking. Before you head out, refresh your memory with hiking tips here: Simple and Safe Hiking Practices for Every Hiker. Enjoy! Brittlebush and Chuparosa fill the slopes below Superstition Mountain on a rainy, foggy spring day. This is a stunning landscape to visit any time of year! At the footsteps of the Superstition Mountains, there are tons of trails that lead from the park into the nearby Tonto National Forest. If you hike far enough up the Siphon Draw Trail you will enter the Superstition Wilderness, and can climb all the way up to the top of the mountain to an elevation of over 5,000 feet! In the spring, there can be all kinds of blooms out here. The one time I went without my camera, the Brittlebush were going nuts! It’s also a common place to see fields of Mexican Gold Poppies and Lupines during wet years, among others. Highly recommended! Location Info: 6109 N Apache Trail, Apache Junction, AZ 85119. Park is open 7AM – 5PM daily. $7 per vehicle fee (1-4 adults). Restrooms available, as well as a full service campground. Insider Tip: You can park at the Historic Mining Camp Restaurant (yes, it’s legal) for free and access the area free of charge with no time limits! Same for the Crosscut Trailhead off of the nearby First Water Road. A palo verde tree blooms yellow during sunset at Picacho Peak State Park. Along the busy but empty stretch of Interstate 10 between Casa Grande and Tucson sits Picacho Peak, a jagged desert mountain that rises abruptly from the desert floor. Picacho is another great destination regardless of wildflowers, the king attraction being a tough dayhike to the Picacho Peak summit. Oh yeah, it’s also home to an old Civil War battlefield. In spring, it is yet another famous location for spotting the coveted but elusive Mexican Gold Poppy. Location Info: 15520 Picacho Peak Rd, Picacho, AZ 85241. Park is open 5AM – 10PM daily. $7 per vehicle fee (1-4 adults). Restrooms available, as well as a full service campground. We’re on a roll with the State Parks (well, we’ve got some nice ones here in Arizona!) This one is just a stone’s throw from Tucson, at the base of the towering Santa Catalina Mountains. You’re about to have deja vu, because I’m here to tell you that Catalina is beautiful whenever you decide to go. It’s got dramatic scenery, great hiking for beginners and experts alike, plus an almost guaranteed wildflower bonanza every spring. Another potential Poppy hot spot. Location Info: 11570 N Oracle Rd, Tucson, AZ 85737 Park is open 10AM – 10PM daily. $7 per vehicle fee (1-4 adults). Restrooms available, as well as a full service campground. Brittlebush out in full-force in the McDowell Mountains. While the State Parks require a fee, here’s a free-bee. Owned by the City of Scottsdale, this nature preserve has a few hundred miles of hiking trails that cross the foothills and mountaintops of the McDowell Mountains. The Brittlebush are probably the best bet for field-covering displays, but there’s definitely variety here with occasional Poppies and all your favorite cactus. There are many trailheads at which you may access the park, with the Gateway Trailhead being the most popular. Also consider Lost Dog Wash to the south or Tom’s Thumb to the north. The hike to Tom’s Thumb is a beast, but is worth it even if the flowers aren’t out. Lost Dog Wash is perfect for those wanting a mellow experience. Location Info: Gateway Trailhead – 18333 N Thompson Peak Pkwy, Scottsdale, AZ 85255. Restrooms available. Sunset over Bartlett Lake as Brittlebush mingle with cholla cactus on the hillsides. A favorite of local photographers willing to walk the trail-less slopes in search of blooms. Although the lake itself, nestled among the desert mountains, is very nice, it’s the hillsides above the lake that bear the wildflowers. Once you park along the roadside, you’re on your own so make sure to take care not to get lost or take a tumble down a steep slope. The location info below lists the address for the marina on the lake, which will help you reach the area via GPS, but it’s up to you to find your way to the wildflower fields! Location Info: 20808 E Bartlett Dam Rd, Rio Verde, AZ 85263. Backlit wildflowers in the Sonoran Desert Preserve, North Phoenix. A local favorite of mine, the Sonoran Desert Preserve is mere minutes from my house! It doesn’t have the consistently amazing displays that seem to pop up seemingly every year at other locations, but hit it after a wet winter and you might find fields of poppies, lupine, and scorpionweed! For a more in-depth look, have a look at this article about the Phoenix Sonoran Desert Preserve. There is a near unlimited number of places to view wildflowers in the Sonoran Desert. Once the weather turns scorching hot for the summer, the Arizona high country is full of forests with their own wildflower displays as well. Go out and explore a nearby mountain park and see what you can find. Wildflowers also grow along the washes behind the neighborhoods and along the city canals. Get creative and find your own wildflower wonderland! The wildflower show along the Taliesin West Desert Walk Tour. Thanks for sharing this. I am the first to admit that I do not think the desert is all that pretty but your pictures sure make it look beautiful.